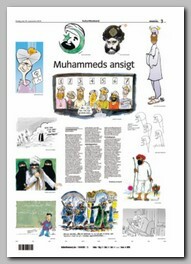 On 09/30/2005 a Danish daily newspaper Jyllands-Posten with about 150,000 copies a day, considered in Denmark as the largest-selling newspaper, published 12 Cartoons that were supposed to reflect the point of view of the ordinary Danish people about Islam and became known as the Muhammad Cartoons. Those 12 Muhammad Cartoons, most of which depicted the Islamic prophet Muhammad, caused an international debate in the European media about the limitation of freedom of speech and the right to criticize Islam or any other belief. Muhammad cartoons caused also an international political crisis between Denmark and some Islamic countries and wild demonstrations all over the world, some of them turned to be violent and even claimed the life of few protesters or by passers. The Danish PM described the events following the Muhammad Cartoons as the Danish worst international crisis since World War II. The Danish government tried to explain and promote dialog but held firm stand for the principle of freedom of speech and free press. On 09/17/2005 a competitor newspaper Politican published an article titled “Profound fear of criticism of Islam” and could not find an illustrator for the article. In response the Jyllands-Posten published on 09/30/2005 an article “The face of Muhammad” with 12 cartoons chosen from work of about 40 artists. On 10/27/2005 some Muslim organizations filed a complaint to the Danish police claiming that Jyllands-Posten had committed offences against the Muslim community in Denmark. On 01/06/2006 the Danish public prosecutor in Viborg discontinued the investigation as he found that the cartoons were consistent with the “editorial freedom to journalists when it comes to a subject of public interest”. The decision renewed and flamed the tension and the public debate all over the world. Islamic radical preachers ceased the opportunity of the Muhammad Cartoons to incite against the Western culture. In over 50 countries newspapers deliberately republished the Muhammad Cartoons to demonstrate their support for the freedom of speech and the right for criticism.